Summary: Learn how to hang a picture and mirror, fit a mirror, hang a picture, attach battens to a frame and fix a mirror to a wall. Hanging pictures and mirrors is a relatively simple project but can have a big impact on the way your room appears. Placing a mirror opposite a window will reflect light into the room, making rooms seem lighter and larger. Conversely, large empty walls can be made to look less stark by positioning pictures at eye-level. Ensure your pictures or mirrors are hung correctly by following the directions below. Be sure to use the appropriate fixings for the weight of the picture or mirror. Light and medium weight pictures and mirrors can be hung from a pin picture hook hammered into the wall, but first check that the plaster is sound. Heavier or wider pictures and mirrors should be hung from hooks at either end of the cord. Another method is to hang a heavy picture or mirror by a chain or wire across the back of the picture, which is then suspended over a round-headed screw fixed into the wall. Most pictures will be safe hanging from wire or cord but heavy mirrors require chains. 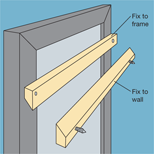 If the mirror or painting is very heavy, you may need to attach battens to the frame and wall. Hold the picture against the wall and check that it is level, using a spirit level. Holding the picture in place, mark on the wall the top corners of the frame. Measure a point half way between these markings. Lay the picture face down on the ground and pull the cord up in the centre with the picture hook until it is taught. Measure the distance between the hook and the top of the frame. This is how far below the top of the frame the hook needs to be. Transfer this measurement to the wall by measuring down from your central mark and position the hook at this point. Drive the picture hook pins, tacks or nails into the wall with a pin hammer. Alternatively the wall can be drilled, plugged and a screw fixed into the wall. 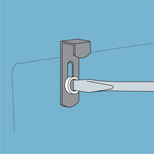 Measure the distance between the hook and the top of the frame and transfer this measurement to the wall by measuring down from your central mark. Heavy pictures can be supported by interlocking battens cut from one single piece of wood with one screwed to the picture frame and the other to the wall. The timber batten should be 50mm (2in) x 20mm (4/5in) and a little shorter than the width of the picture. Lay the picture face down and mark the position of two screw holes on each side of the frame. The holes must be the same distance from the edge of the frame so that the picture is balanced. 15mm (3/5in) from the edge of the batten mark a straight line all along its face. Using a circular saw make a mitre cut along the marked line at a 45° angle. Screw one batten to the picture frame with the angle facing down. Drill and plug pilot holes in the wall at the required height, then screw the second batten to the wall with the angled edge facing up. 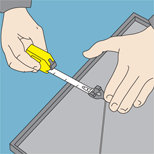 Use a spirit level to ensure the batten is level. The battens will now interlock and support the picture frame. Fix interlocking battens to the picture and the wall. Some unframed mirrors have holes drilled for fixing. 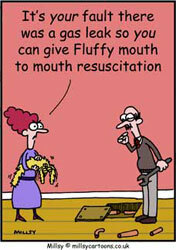 Others can be fixed using corner or sliding clips. The number of clips required to hold the mirror securely will depend on the size of the mirror. The minimum number you will need is two at the bottom and two at the top. Using a spirit level and straight edge mark the position on the wall where you want the bottom edge of the mirror to go. Holding the mirror firmly against the wall with its bottom edge against the marked line, mark all four corners and the top edge. Drill holes 50mm (2in) in from the corners but remember to allow for the distance between the wall and the top of the clip. Not drilling deep enough will cause the screw head to protrude too much and it will not grip the clip to the wall. Secure the bottom clips firmly to the wall but allow the top clips to have enough play to move up and down. Fit the bottom edge of the mirror into the bottom clips and, holding the mirror against the wall, carefully slide the top clips down over the mirror's top edge. Allow the top clips enough play to move them up and down to slide down over the mirror's top edge.